This trail goes from Monte Corno to Stützpunkt Perlone and Busa dei Capitani, some of the strongholds along the Austro-Hungarian front line during the Great War. 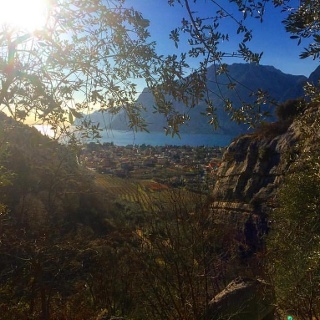 The trail climbs through olive groves and chestnut woods to the summit of Monte Corno. A panoramic and therefore strategic position overlooking the pass below, there is an extensive defence system composed of trenches, walkways, tunnels, artillery and gunnery stations. "Busa dei Capitani" got its name from the two bas relief busts found inside the ruins of a military building. It proved impossible to tell who they were supposed to represent until a local historian identified Emperor Franz Josef and his successor to the throne Archduke Karl of Habsburg. The Archduke was a frequent visitor to the Trento front as Commander of the Armed Forces and a signature on one of the busts is most likely really his. 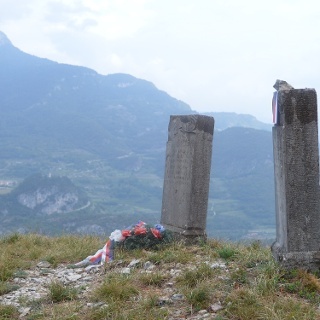 The entire Monte Corno area has been the focus of a restoration project carried out by the association "Un territorio due fronti" (“One territory two fronts”), which unites over 25 volunteer groups and deals with relics of the Great War in the municipalities of Mori, Brentonico, Ronzo-Chienis and Nago-Torbole. From the car park follow the roundabout and take the exit which leads to the Nido d'Aquila apartments where a red and white arrow points the way to go. Continue down the road until you come to a junction with a sign illustrating the trails in the area: here take the mule track on the right. The trail starts to climb through the woods until it comes to the ridge and turns into a mule track again at Castagneto di Nago. Along the trail there is a signpost with directions for the rifle position which overlooks Nago. 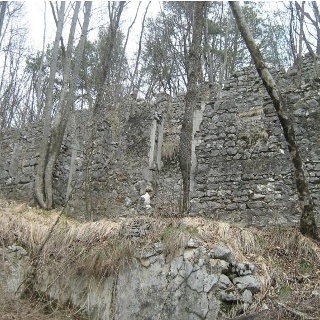 There are other military relics from the First World War in the Castagneto area like the “stol” (storerooms built into the rock), walls and trenches restored by the volunteers of the local association Associazione Castagneto Monte Corno di Nago. Continuing along the forestry road after the signpost for Castagneto beside the cistern there is a turn-off where you go right on a forestry road in the direction of the car park. Here take the mule track in the direction of Busa dei Capitani, taking care to detour to the right on the trail which leads to Stützpunkt Perlone: here you can visit a long tunnel excavated into the rock with lookout posts over the valley and a wonderful original staircase restored by the volunteers of the Schützenkompanie of Arco. 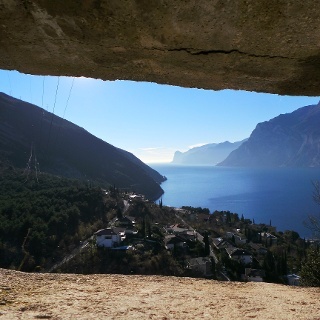 There is a stunning view of Lake Garda from the meadow in front of the tunnel and on clear days you can see as far as Sirmione at the other end of the lake. Now follow the trail past the lookout post until you come to the rocky trail SAT 637. Here a short detour takes you to the Salina Trench which is perfectly preserved and offers marvellous views over the valley. 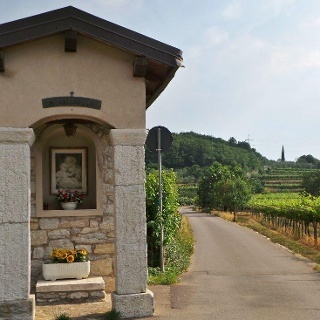 Head back and continue northwards along the trail through the woods and a clearing with a hunters' hut until you come to the junction with a wooden signpost for Prà delle Cornale. Follow the signpost and start to descend, passing ruins of barracks and military buildings. Keep going along the flat through a chestnut and hazelnut wood until you come to the paleo-landslide area with its massive boulders which the soldiers used as natural shelters during the war. Keep going straight on until you come to Busa dei Capitani, which was recently restored. Now turn back by the same trail following directions for Prà delle Cornale until you come to the car park. Take SAT 637 which runs along the Ago trench system: two long trenches and a rock shelter in a perfect state of conservation. The descent continues as far as the town of Nago. Continue down via Stazione until you come to the main road SS240 and the car park you started out from. 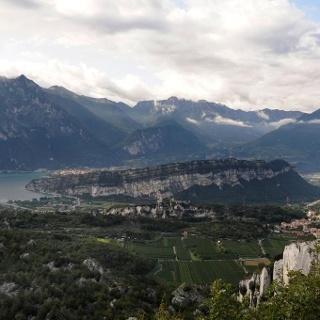 You can get to Nago on the number 3 urban bus or with the intercity bus Riva - Rovereto - Trento. Info and bus times on www.gardatrentino.it. The free car park (starting point for the hike) is at the roundabout at the start of the town (via del Trenim, parking place Coel).